Where is bamboo flooring produced? Bamboo flooring is found in homes throughout the world. China is by far the world's largest and most active producer of bamboo flooring and exports millions of square feet of material per year. The most commonly used species in production is Moso Bamboo, Phyllostachys heterocycla f. pubescens. Moso is among the largest and fastest growing species on the planet, and is found frequently throughout mainland China. Grade A - Top Quality, used for flooring and weaving material. Grade B - Medium Quality, used for plywood and furniture. Grade C - Lowest Quality, use in pulp production for bamboo textiles. Grade 1 Moso Poles in China. How is bamboo flooring manufactured? The first and most important step in bamboo floor manufacturing is the selection of the raw material. The final product is only as good as the quality of the original bamboo cane that was used. Quality poles must be hand selected by an actual human being a separated into the proper grade. 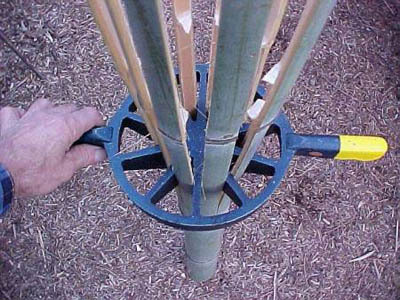 The next step is to split the bamboo cane into usable sections. This can be done by hand or by machine. High capacity facilities will feed the bamboo through machines that split the bamboo into usable sections. Once the cane has been split, it is then milled to remove the nodes and skin on its outer layer. These planks give bamboo flooring the appearance we are familiar with. The picture below shows a bamboo cane being split by hand. After the planks have been sorted, the next step in the flooring production process is to carbonize the bamboo. The process of carbonization removes the organic material from planks, which eliminates the chance of rotting or other unwanted natural processes. Carbonization will increase the strength and longevity of the bamboo, while retaining its natural beauty. The carbonization process in done by boiling the bamboo planks or by scorching the material in an oxygen deficient stove to avoid combustion. The end result is a durable and long-lasting raw material. The last major step of the process is the gluing and molding of the carbonized planks. In China, this is done by laying the planks side by side and then lathered with glue. They are then immediately pressed to disperse the glue throughout the material. The material is then allowed several days to harden completely. And that is how the process is done... There are are several other optional steps, such as dying or staining, but this is the general process in a nutshell. The manufacturing process of bamboo flooring is displayed in the chart below. 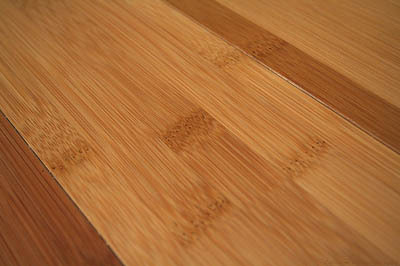 What are some common applications for Bamboo flooring? 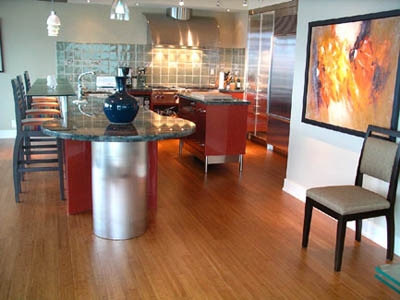 Bamboo floors are used commonly in homes throughout the United States and beyond. It is a great alternative to other common hardwood flooring materials such as spruce or pine. Not only does it offer practical advantages, but it is also great for the environment. Bamboo flooring is resistant to bugs and insects, and can also block out moisture. Watch videos about bamboo flooring below. Why is bamboo flooring beneficial for the environment? 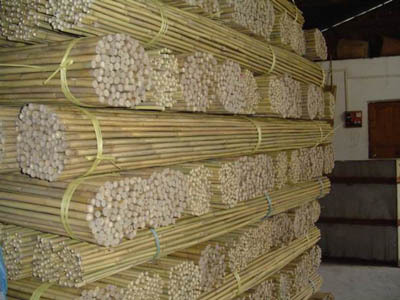 Bamboo is a highly renewable resource and a super-productive biomass producer. When compared to other hardwood flooring choices, bamboo is over 25 times more efficient shear mass production. The United States Green Building Council awards points for the use of bamboo flooring. Copyright © 2008-2012. Complete Bamboo. All Rights Reserved.